These parties take place at our main Broad Lane site in the evening. All puppies having their primary vaccination course with us will receive an exclusive free invitation to one of our Puppy Parties. 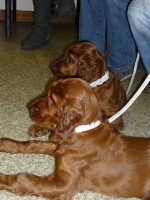 All puppies should bring their owners with them and everyone in the family is welcome to come along and join in the fun! The parties aid early socialisation, allowing puppies to meet and play with other puppies in a controlled and safe environment. Our Veterinary Nurses provide free advice, practical puppy care demonstrations and puppy play. 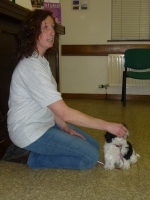 Nicky from ‘Sound Hounds’ training school is on hand for expert behavioural advice and to demonstrate basic obedience training: http://soundhoundsdogtraining.co.uk. You and your puppy also get to to take home some great free gifts. For more information please telephone Broad Lane Vets and ask for Sarah K.